I’ve been waiting for today for too long! Peli has announced that Pex 0.5 has been released and is available to download today! In this post, I am just going to have a very quick look at the release. Expect a lot more posts around this framework, best subscribe now so you don’t miss any. 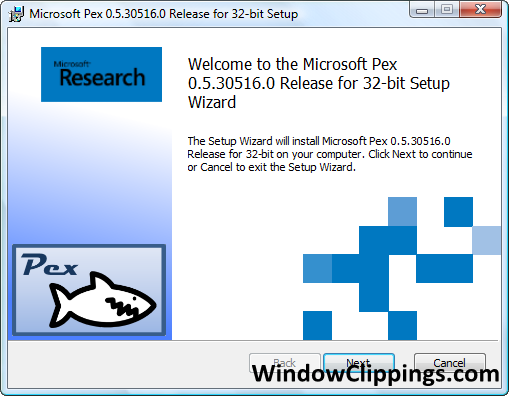 Pex is a Microsoft research project which generates tests that cover all possible inputs. It does this by a mixture of staticdynamic analysis while taking advantage of the CLR Profiler to analyse your .Net code to find all the possible paths. Pex can then creates a series of test inputs for a test YOU wrote, you write the test which Pex then uses to find all the possible routes. You can use these tests in order to find all the different possible combinations for your application, find the areas where their are problems and have Pex suggest possible fixes. Pex comes with a Visual Studio Add-in which only works with Visual Studio 2008 Professional (or higher). 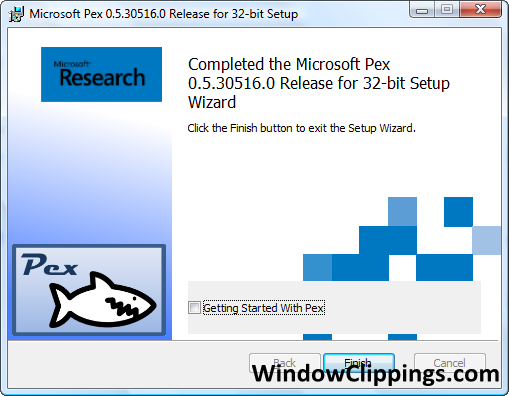 Pex also works from the command line without any Visual Studio on the machine. Very simple msi – just click next a few times.. The team has spent a long term putting together some documentation and samples on how to use Pex which is great (especially for a research project). 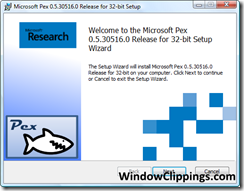 The samples are installed as part of the main framework and are in a zip file linked off the Microsoft Pex start menu item. Within the zip there is a VS2008 solution, with a project Samples.Pex which appears to contain samples for a lot of the functionality (without researching more I can’t tell what). Within the samples, the first test I picked at random is the LuhnAlgorithmTestClass. 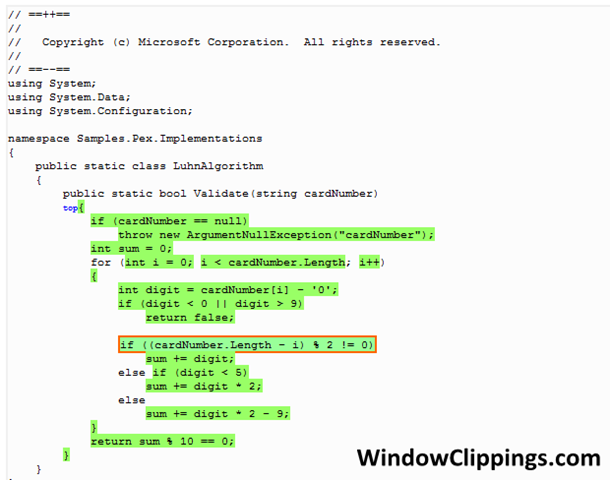 This was of interest because I had a similar test scenario for Red Gate SQL Data Generator as that has a Credit Card Number Generator for the Luhn Algorithm. The test itself, based on MSTEST, looks very standard. At the class level, we add a PexClass attribute and give the type of class we are testing against. The MaxRuns defines how many runs will be tried during the exploration. The test itself, we add a PexMethod and most importantly a parameter for the input to use. Pex will then use this test to generate more exploratory tests and use the parameter to inject the value to test against. 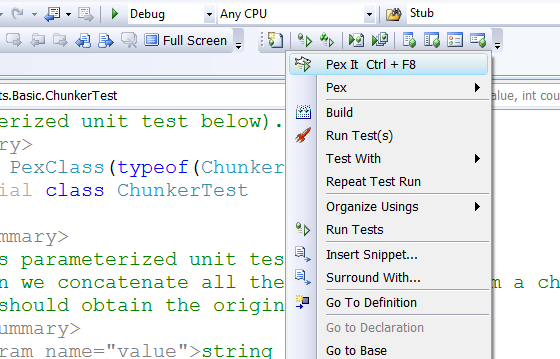 Pex includes a Visual Studio plugin, I can write click and go Pex It! This should run all of my unit tests, but after executing Pex It! I got an error ClrMonitorFail (-667) – “Exit code returned when the ExtendedReflection profiler encountered a fatal error.” within the Pex Results dialog. I’ve logged this with the team, if I get a solution I will post it online. Copyright (c) Microsoft Corporation 2007-2008. All rights reserved. This is showing that Pex is working against the LuhnAlgorithmTestClass.CharactersAreNotValid(string input) test (as shown above), and is generating multiple different tests based on that initial test. The report contains a lot of information about the execution. 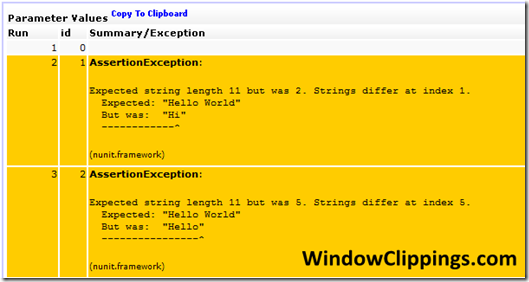 Clicking the name of the test class takes you to some more information about what was executed. Clicking the parameter values link will display all of the values used for the different tests. Each parameter sends the code down a different route. Another link which interested me is the Coverage link for the LuhnAlgorithmTestClass. Clicking on this, you get a really nice Code Coverage report page. Putting this a different way, by writing a single test with a parameter, Pex can create us a series of different tests to execute all of the possible routes in the method. This is great! As a developer, I can focus on creating a test which can exercise the method, but don’t have to worry about all of those edge cases as Pex will help find those. Hopefully you are still with me, now I just wanted to create a very quick Hello World application. The class I have developed is this HelloWorld class, it has three different paths different different values for each. The related test is this HelloWorld(int id). 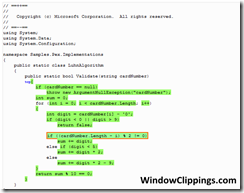 Pex will input the required parameters as a argument, and then execute the test. We want to ensure Hello World is returned. On the HTML report, it displays three different parameters which caused it to go down different routes. For 0, it worked as expected. For 1 and 2, the test failed. To prove this, I wrote a classic test which worked successfully. What has Pex done for us? Well, it has identified one working parameter and two parameters which will cause the test to fail. This is a huge framework and I have only just scratched a very small surface area. I haven’t even touched the more advance parts (I will need to read the documentation for that). I will be posting more, writing more and generally seeing what this framework is actually all about. Still not 100% convinced about this framework, I’m saving that until I see more. Not being able to use it against a commercial application might limit my venture. 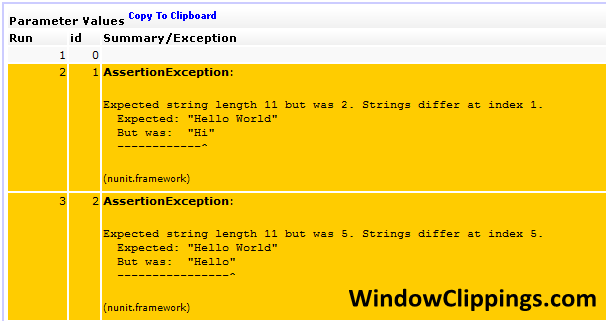 Hi Ben, the hello world example is too simple since the correct solution is zero. Pex starts with the simplest solution and builds it’s knowledge from there. In that sense, the simples integer value is default(int) = 0… so the first guess was the right one — by sheer luck. Does it or can it actually create the test methods and insert them into a test project? Totally agree – the example was too simple but I just wanted to create something and see it execute. Under the covers, it does create the test methods for you. I think it then does insert them into the project with a .g. tag. More will be covered in my next post about this. 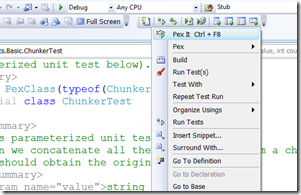 In Visual Studio, Pex inserts tests in a nested file (one nested file per parameterized test). Pex also does some book keeping to avoid generate duplicates. – you can import a Pex xml report back in Visual Studio and ‘replay’ the run, inserting the methods. That’s awesome! I’m always trying to get full test coverage, and this might be the ticket to save some time. I just sat down to start playing with Pex and blogging about the results and got exactly the same ClrMonitorFail error. Oh well. If you face the ClrMonitorFail issue, we have a problem if TypeMock is installed on the machine. Please try to ‘disable’ TypeMock and try again. Nice post! 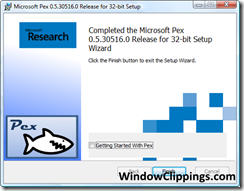 I have written another article that shows how to use Pex. It was indeed TypeMock in my case. Next Next post: Rhino Mocks 3.5 – Goodbye Record and Playback!